The Collar Spread is similar to the Covered Call trade, except an investor will purchase a Put to protect against a sudden decline on the stock. Like the Covered Call, the Collar Spread is a neutral to bullish strategy. But, there are many different combinations of the Call and Put option that an investor can use to help them limit the risk and maximize their returns. In a Standard Collar Spread, an investor will buy shares of stock and then sell an ATM or OTM Call against those shares, just like a Covered Call trade. Then, the investor will purchase an OTM Put for the same expiration month as the sold Call. The primary risk in a covered Call strategy is that the underlying stock may decline faster than we can collect premium. By purchasing an OTM Put option we can protect the position from a large drastic decline in the stock price. The covered Call sale helps finance the purchase of the Put option. This strategy offers greater protection and is considered more conservative than a similar Covered Call trade, but some of the return is sacrificed when the investor purchases the Put option for extra protection. 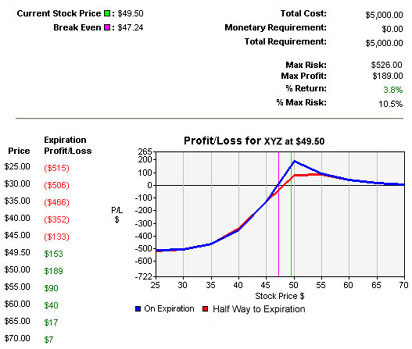 Since the loss in the stock price is limited by the Put, a maximum loss can be calculated. The net premium, maximum risk, percent maximum risk, break even and percent to break even are presented in the Search Results. 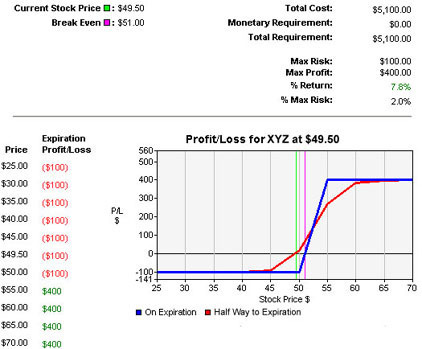 Buy 100 shares of stock XYZ @ $49.50. (A negative % to Break Even means the BE price is above the current stock price). In the Debit Collar spread the investor is risking a much lower amount while having a higher % if Assigned return. 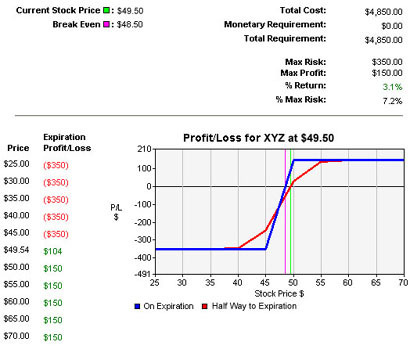 However, in order to achieve the higher return stock XYZ would have to be trading above $55.00. For the Standard Collar, the stock only needs to be trading above $50.00 for the trade to earn 3.1%. The Debit Collar offers a much greater protection and lower monetary risk, but there is also a lower probability of earning the higher return. Each investor will have their own personal Risk-Reward tolerance as to what the wish to risk, what type of return they want to achieve compared against the probability of making that return. In addition to adjusting the Call and the Put strike price for a Collar trade on a given stock, some investors like to purchase the Put option further out in time from the sold Call. This is due to one of the fundamental rules of options investors: Investors will increase their annualized return when they sell month by month, and will decrease their annualized cost if they buy an option further out in time. If an investor was planning on holding the stock for a 3, 6 or 12-month period, they might be able to lower the cost of protection by purchasing a Put that is 3, 6 or 12 months out in time. Let's say we were planning on holding the position and trading a Collar spread against the stock every month for the next 6 months (180 days). Assuming that the stock stayed at the same price for 180 days and the one-month out options remained at the same price, we would roughly collect $9.00 in Call premium ($1.50 for each month over 6 months) and we would have paid $3.00 in Put premium ($0.50 * for each month over 6 months). Right now, the 6-month out (180 days to expiration 45 strike Put is only trading for $2.00. Buying the far out Put today would potentially save the investor $1.00 in premium over the 6 month period. Normally, this type of Collar is similar to the Debit Collar as you may end up paying more for the far out Put then you receive for the near term Call. (For Collars where the Put is farther out in time, the Black-Scholes pricing model is used to calculate the Break Even price, as the Put option will have remaining time value). (This maximum profit does not take into account any theoretical remaining value of the long Put). (The Black-Scholes pricing model is used to calculate the remaining Put value). Just like the other Collar examples, the maximum profit is achieved when the stock is trading right at the short Call strike price at the near term expiration date. Even though the maximum profit is $0.00, there is still a potential profit on the position, as the put will still have 5 months of time value remaining. But remember, an investor who enters a Collar position where the Put is further out in time is looking to save premium on an annualized basis, most likely they are planning on holding the stock for an extended period of time or they have a specific methodology designed to roll the Call position month by month. There are various other combinations that be used, both to be more conservative and to be more aggressive. Instead of discussing all of the combinations in this initial Help page, we will outline the various risk-reward values for the various Collar spread combinations in the Learning Center of the Collar Page. If you like the idea of additional protection but wish to generate income at the same time, check out the Collar Spread strategy. If you like the idea of additional protection or insurance, but you are bearish, check out the Married Call strategy. The Covered Call Challenge Part 1 of 4 in an article about Married Puts and Collars. The Limited Risk Solution Part 2 of 4 in an article about Married Puts and Collars. Examples: Married Put/Collar Strategy Part 3 of 4 in an article about Married Puts and Collars. Find Married Puts/Collars with PowerOptions Part 4 of 4 in an article about Married Puts and Collars. The Sketch Learn to "Bulletproof" your portfolio.